Stephanie Miles joined CFG in 2017 as an Operations Analyst and brings 10+ years of experience as a Business Development and Client Relationship Management professional in financial services. Stephanie shared mutual clients with CFG while working for The Padon Company, another M Financial partner firm located in Houston, TX. As a result, she had intimate knowledge of and respect for CFG’s capabilities and client-centric focus. When the opportunity arose, she was eager to apply her expertise in data administration and systems to streamline processes for operations and new business. 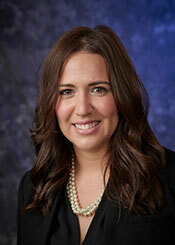 Stephanie has spearheaded several projects and is a valuable support to CFG’s already impressive team. “What attracted me most about working for Cohn Financial Group was the passion and pride each team member possessed for their work and their clients,” says Stephanie. The close relationships, both with clients and each other, were already in place. She sees her contribution as simplifying, enhancing, accelerating, and creating better ways to turn data into useful information. As CFG grows, she wants to help preserve the conversant and personalized service that clients find so attractive. Stephanie holds a BBA in Marketing from Sam Houston University. She is discovering how best to offer her skills as an experienced volunteer in Animal Welfare, Homeless Youth, and Human Trafficking Awareness to charities in Phoenix. She also enjoys traveling, renovating homes, reading, hiking, and trying new foods and restaurants.